Canadian racer Roman De Angelis picked up his second victory of the 2018 Porsche GT3 Cup Challenge USA by Yokohama in a pole-to-checkered flag performance on Friday afternoon. Driving the No. 1 Kelly-Moss Road and Race Porsche 911, De Angelis managed to build a nice gap to second place Trenton Estep at the drop of the green flag for the 45-minute race and did the same again on a restart following an opening-lap incident involving Greg Palmer in the No. 44 Kelly-Moss entry. Palmer was not injured. Once he built the gap to Estep, De Angelis spent the rest of the race managing his advantage over the Platinum Cup class points leader. He went on to win by 2.463 seconds over Estep for his first victory since winning the first race of April’s doubleheader at Barber Motorsports Park. “Honestly, I’ve never driven a car better than today’s in my life,” De Angelis said. “Kelly Moss Racing, Racing For Children’s Hospital Alabama gave me literally the perfect car today. It kept going quicker and quicker through the race and at a track like this with the heat that’s really, really rare. With the victory, De Angelis managed to close the championship gap to eight points, 221-213, behind Estep, whose runner-up result was a relief of sorts for him and the No. 3 JDX Racing team. Estep crashed in Thursday’s second practice session along with Sebastian Carazo in the No. 27 NGT Motorsport Gold Cup class entry. Neither driver was injured in the incident, but Carazo was unable to participate in Friday’s race. JDX Racing, meanwhile, pulled an all-nighter to get the No. 3 machine back on track in time for qualifying Friday morning, in which Estep placed the car second on the grid. 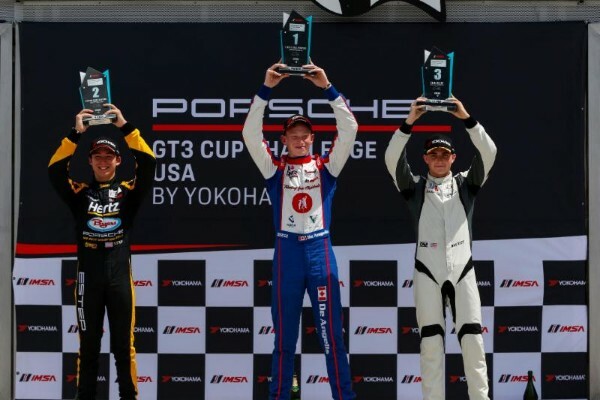 In the race, Estep posted the fastest lap which puts him on the pole position for the second and final Porsche GT3 Cup Challenge USA race of the weekend Saturday morning. Maxwell Root, the 2018 IMSA Hurley Haywood GT3 Scholarship winner, came home third in the No. 7 Wright Motorsports Porsche. The performance matched Root’s best run of the season, which came in March’s first round at Sebring International Raceway. Michael Levitas scored the Platinum Cup Masters victory in the No. 36 TPC Racing Porsche 911, beating Alan Metni in the No. 99 AM Motorsports/Kelly-Moss machine to the stripe by nearly 15 seconds. It was the second victory of the season for Levitas, who also took the Platinum Masters win in the Sebring opener. Coming home third in Platinum Masters was the No. 34 Shaun McKaigue in the No. 34 Fer-Pal Infrastructure Porsche. It was McKaigue’s best run of the season. David Baker earned the Yokohama Hard Charger Award in the No. 56 Topp Racing Porsche for most positions gained from start to finish in the Platinum Cup class. Charlie Luck, who finished fourth in Platinum Masters driving the No. 45 Wright Motorsports entry, continues to lead the class point standings. He’s now 15 points ahead of Metni, 219-204. Kurt Fazekas picked up his second victory of the season in the Gold Cup class, for Porsche 911 GT3 Cup cars built between 2014 and 2016. Driving the No. 52 Kelly-Moss Road and Race entry, Fazekas was the beneficiary when class leader Victor Gomez IV spun in the No. 25 NGT Motorsport Porsche after contact from behind by Mark Kvamme in the No. 43 JDX Racing entry. “There had to be a lot of luck,” Fazekas said. “I was chasing the (No. 25) car and he was pretty quick, but unfortunately he had some contact. We were making our way through the field and I had just one car between us, but getting there and getting the pass done is a whole different thing. Fazekas went on to win by slightly more than one second over Bill Smith, who finished a season-best second in the No. 42 Topp Racing Porsche. Gomez battled back after the spin to finish third and retains the Gold Cup class points lead by 14 points, 233-219, over Fazekas. The second and final 45-minute GT3 Cup Challenge USA race of the weekend starts at 9:20 a.m. ET. 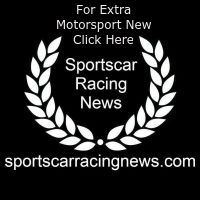 The race will be streamed live on IMSA.com.